Ismail Mohamed Ahmed has over 12 years of experience in mechanical & marine engineering, training and health & safety management. Ismail currently works for Bapco as behavior based safety champion at Fire, Health & Safety Department. He worked as a marine engineer at United Arab Shipping Company for 4 years, then joined Bahrain Training Institute to head the health & safety training department. 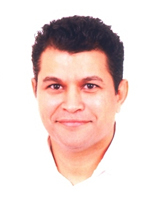 Ismail has been one of the main speakers and participated in organizing national and international conferences. Ismail has an undergraduate degree in marine engineering from Southampton Solent University in the UK and a Master degree in Environment, Health & Safety from Sunderland University in the UK. Ismail is pursing his PhD studies in the area of decision-making and improvising at University of Bradford in the UK.